Below are just a few of the testimonials we’ve received regarding our services. We strive to be the very best and if you need assistance with any type of pet care, whether its sitting, dog walking or boarding, we hope to be on your short list to contact for your furry loved ones!! I can’t say thank you enough for the personal investment you have put into the health and emotional welfare of my crazy kids. We could not have come this far without you! I can’t thank you and your wife enough for providing such a nice puppy hotel last weekend. Your compassion for animals is very apparent. I’m very grateful for the advice on potty training and biting — it has made a big difference in our home this week. I will be calling you soon to book some accommodations for the summer. We are on cloud nine in regard to having your service for our company. You’ve truly been a blessing. You guys really ARE full service! I’m talking WestFetch up all over the place! We can’t get over how well Miley does on her walks now. She hasn’t been growling at people and runs to the door when it’s time to go out. So amazing! We are very pleased with your service. Oscar always comes back acting totally himself. We have had him at 2 other places (when you were busy, of course) and each time he came back acting a little out of sorts. I don’t know how to describe it exactly, he just wasn’t himself. He comes back from your place exhausted..ha ha…but acting exactly like he does at home. Thank you both so much for taking such good care of him. It’s hard to leave him behind, but knowing he is so happy and well cared for makes it a LOT easier. I know I’ve said it before, but it’s important I tell you again. You guys are so special to our family, because you understand the love of a family pet. 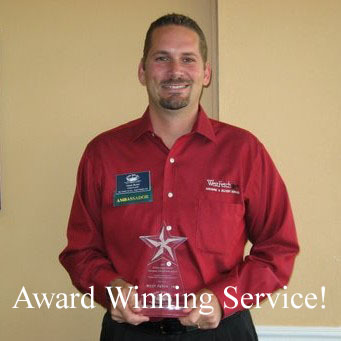 We could never possibly thank you enough for the wonderful service you provide! Thank you so very much. Thank you for taking her on, for loving her and spoiling her and allowing her to be just a dog. Dante is so gentle with her and I think it’s wonderful that they all get along so well. We are truly blessed to have found you. You have exceeded our expectations in every way. After a bumpy road of dog sitting arrangements, we finally found the answer to our prayers! Your calm and welcoming demeanor reflects your experience and passion for animals (and their worried parents). We cannot thank you enough for embracing Nanette as she slowly discovers that most humans are kind and gentle.